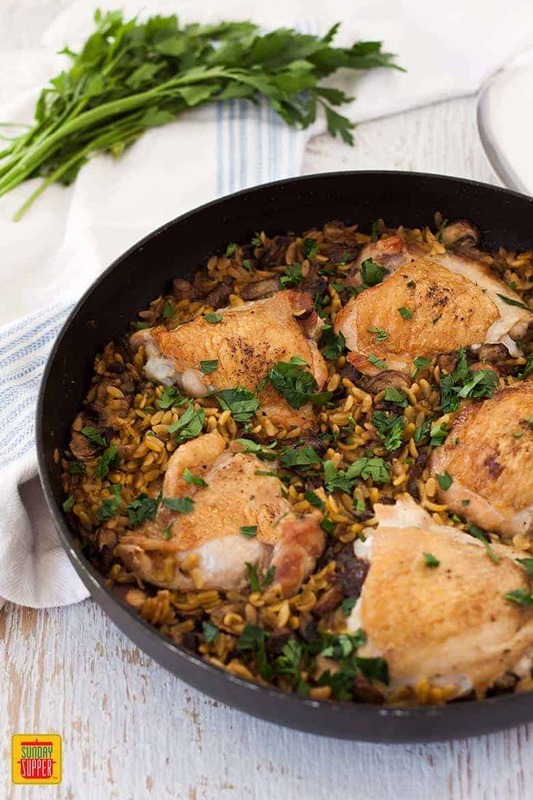 This EASY one pot chicken dinner will become your go-to dinner recipe any night of the week! 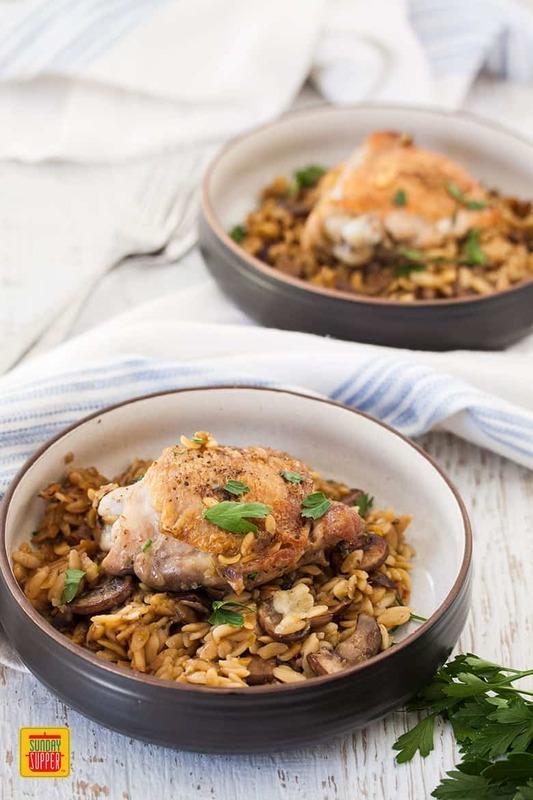 One Pot Chicken Orzo Pasta with Mushrooms is creamy, comforting and incredibly easy to make. Using simple ingredients, it comes together quickly for an easy dinner your family will love it! So how much do you love one pot meals? If you’re anything like me, you really, really love one pot meals. 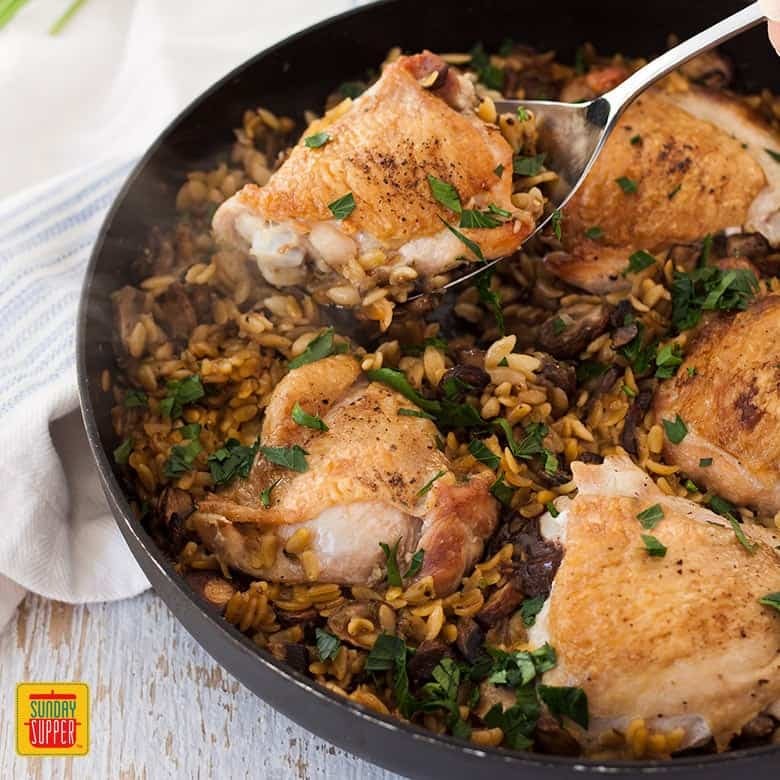 The fact that everything is cooked in just one pan means washing up is a breeze, but more important is one pot chicken meals are quick and very tasty too. The flavors all get a chance to infuse together meaning one pot meals are often very comforting as well. 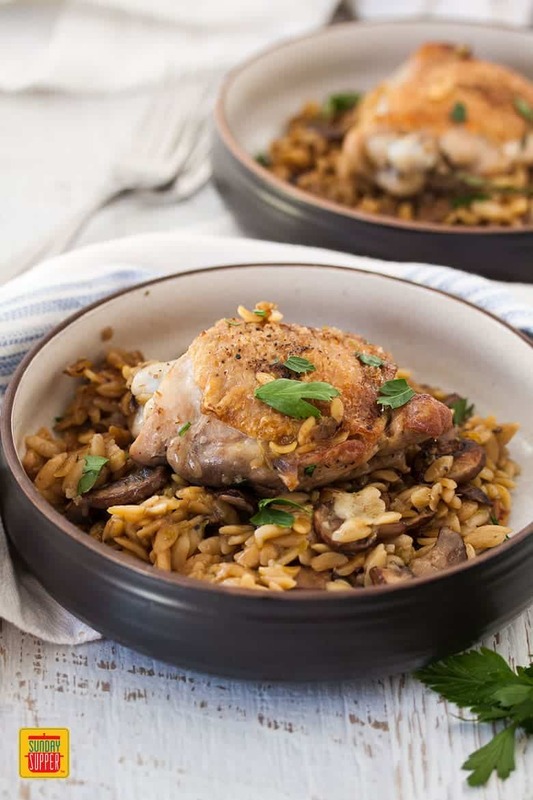 Easy chicken dinners are my go to and this One Pot Chicken Orzo Pasta with Mushrooms combines simple but delicious flavors perfect for a family meal. You can probably tell I’m a big chicken fan. Chicken is just so versatile, works well with so many different flavors, and can be cooked in such a variety of ways. Baked, stir fried, poached, the list goes on, and totally perfect for a one pot meal. We have so many wonderful one pot meals on Sunday Supper, including this One-Pot Mexican Chicken Pasta. So I keep mentioning orzo pasta. If you’ve not come across it before, orzo, also known as risoni, is a cute little pasta that looks like rice. Yep, just simple pasta. 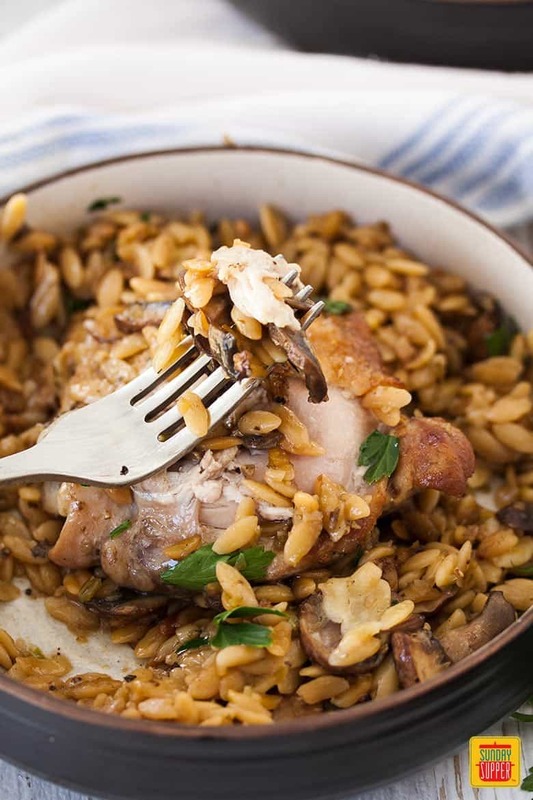 Because of it’s size, orzo cooks very quickly and is perfect in dishes like my One Pot Chicken Orzo. It also works brilliantly in salads and soups. If you love orzo and pasta like I do, check out this Cheesy Orzo Pasta Bake or how about this Creamy Chicken and Tomato Pesto Pasta Bake. Once all is said and done, you can have this dish on the table in under half an hour. 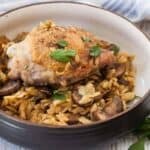 A satisfying, flavorsome one pot chicken dinner that your family will love and likely go back for seconds. Heat the oil over high heat, then add the chicken thighs, skin side down. Cook for about 5 minutes until the skin is nice and golden, then turn over and cook for another 3 minutes. Drain away most of the excess oil, leaving about 1 tablespoon in the pan. Turn the heat down to medium. Add the onion, celery and garlic and saute, stirring often for 2-3 minutes until starting to turn translucent. While this is happening, in a small bowl, pour the boiling water over the dried porcini. Let it sit for about 2 minutes to soften, before scooping out the mushroom and finely chopping them. Strain the porcini stock into the chicken stock to remove any grit. Turn the heat down to low, so you just have a very slight simmer. Cover and cook for around 10-12 minutes until the orzo is tender.